One person has been arrested amid a protest in Toronto over an appearance, at a debate, by one of the masterminds of U.S. President Donald Trump’s election. Police confirmed one arrest before 6 p.m. ET, but a spokesperson could not offer details. A CBC photographer captured one person, seated and facing a wall in handcuffs. 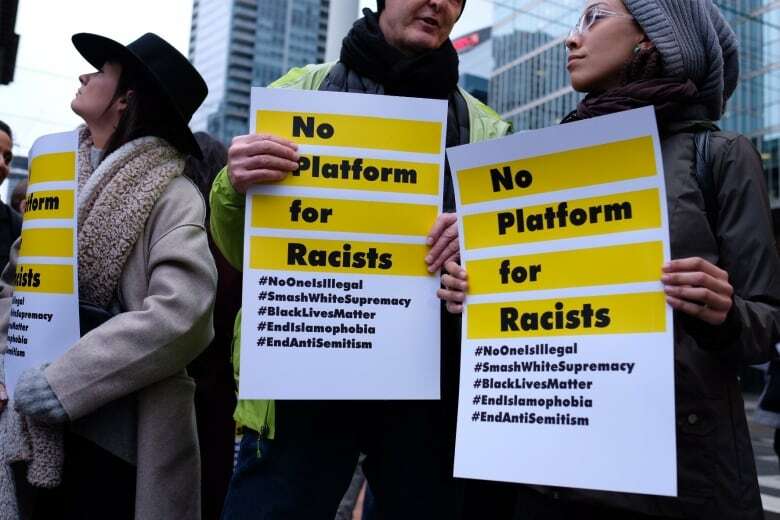 Hundreds of people gathered outside Roy Thomson Hall in downtown Toronto on Friday to voice their opposition to the debate’s participants, former Trump strategist Steve Bannon and political commentator David Frum. 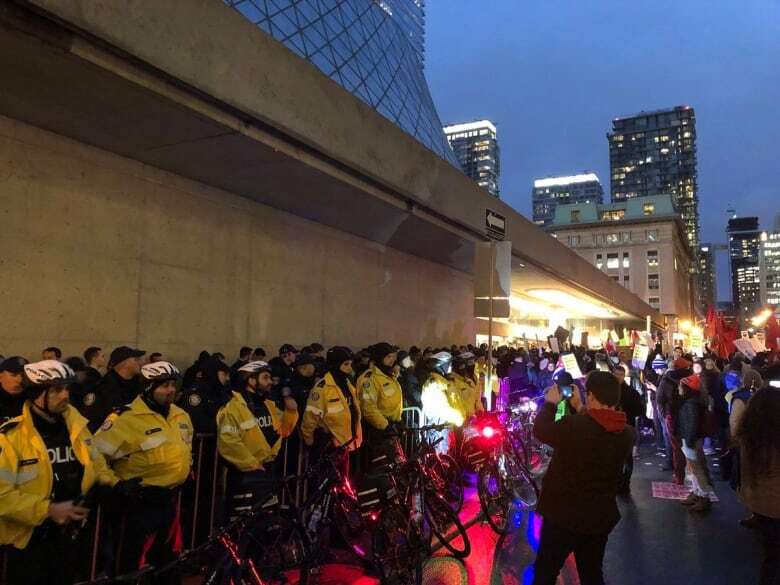 As the attendees arrived to watch the debate, the crowd of protesters grew to the point where police lined two deep between them and those waiting in line to enter. The dramatic scene outside the Munk Debate slowed entry to the venue, and organizer Rudyard Griffiths took to the stage to tell the few who had made it inside that the debate, which was scheduled to begin at 6:45 p.m., could be delayed by up to 45 minutes. Bannon will debate Frum whether populism is the future of Western politics. ​Bannon will argue for the proposition; Frum against. While the Munk Debates are a popular for the city’s political movers and shakers, the announcement of Bannon’s participation back in September sparked an immediate backlash. A petition opposing Bannon’s participation garnered hundreds of signatures, while earlier this week, the federal NDP called for the debate’s outright cancellation. Hours before the debate, a consortium of groups led by No One Is Illegal, released a petition opposing the event that had some 5,000 signatures. The group also organized a protest outside the venue that began at 5 p.m. The first protester arrived before 4:30 p.m., holding a sign saying “just say no to hate,” with a photo of Bannon beside an equal sign next to a photo of a garbage can. Bannon has long been a lightning rod for criticism of the alt-right movement, which he gave a home to in the form of his far-right news and opinion website, Breitbart. He was also Trump’s chief strategist until he left the White House last year. But Frum’s presence is also not without controversy over his role as a strategist and speechwriter for former U.S. president George W. Bush. “Civil and substantive public debate of the big issues of our time helps all of us better understand the challenges we face as a society and what, if anything, can be done to resolve them,” he said.